Like many who live on the East Coast, we love to head towards the ocean to escape the heat and enjoy the cool breezes and the sound of the waves coming in to the shore. 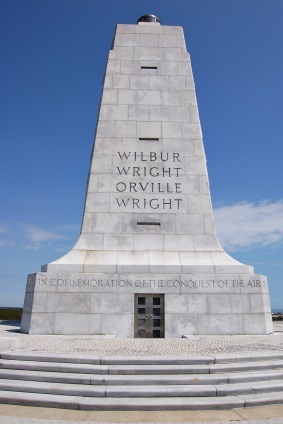 Several years ago, as we were driving through the coastal areas of North Carolina, we stopped at the Wright Brothers National Memorial in Kill Devil Hills. This contains an impressive monument to the Wright brothers, and also an interesting museum where you can find out more about them and their accomplishments. As we walked through the museum and looked at the displays, I was struck with the amount of time and effort the brothers devoted to their quest to master manned flight. There were dozens of notebooks containing page after page of written notes. There were wind tunnels that were built so that they could better understand air movement and lift. There were more model wings and gliders than you could count. As you can imagine, Fluffy was in Boy Heaven. He could have stayed in this museum for the rest of his natural life. I am only surprised that there is not a Wright Brothers Memorial Graveyard attached to the area — not for the Wright Brothers themselves, you understand, but for all the boys like Fluffy who would want to be planted for eternity in a place that was so near and dear to their little boy hearts. I had forgotten about this until recently, until a friend published a review of the new book The Wright Brothers. Although I have not read the book yet, I think the author also uncovered the drive and determination that drove Orville and Wilbur Wright to their success. One of their motives for moving their operation to North Carolina was so they could better observe the flight of seabirds, and incorporate the operation of avian wings into their own wings. All of this reminded me again how much work went into this effort. It was nothing that was done on a lazy Friday afternoon when they had nothing better to do. There was a whole lot of planning. There was a whole lot of thought. There was a whole lot of trial and error. There was a whole lot of failure. Sometimes we get an abbreviated view of history. We think back to our school lessons, and remember the Wright brothers as the guys with the bicycle shop who put together a plane when they got tired of fixing bicycles. As with most things, the truth is always more complex, less exciting and much more work than the Cliffs Notes version would have us believe. It took Edison 14 months and 1400 different experiments to get an incandescent lightbulb to work. When I think of an answer I got to one of my prayers once — “You don’t wait long enough” — all I can say is that I am not in the category of a Thomas Alva Edison. We need to remember Edison’s example as it applies to our own lives. Getting an inspired idea is just the first step in the process, and it needs to be followed by a lot of hard work. A writer friend of ours used to give a workshop called “1000 ideas an hour,” where he would start a conversation with the audience about possible ideas for a best-selling novel. Indeed, before the hour was over, we would have come up with many great ideas. But ideas are cheap. It’s the other 99% of the work involved that turns the idea into a success. Book of Mormon action figures. We only needed five basic male figures, plus a female figure. With changing costumes, they could be adapted to fill the roles of all the characters in the Book of Mormon. We figured they’d be a lot better for kids to play with than the He-Man action figures that kids were playing with in sacrament meeting at the time (now that tells you how old this idea was!). Botchie beans. My mother’s caretaker when she was young (her mother was deceased) was a little old lady who made the world’s best baked beans. Before the advent of Bush’s baked beans, we tried to figure out a way to market Botchie beans. Botchie beans are still far better than anything Bush’s puts out. Italian olive salad. Unless you have been to New Orleans and eaten a muffaletta sandwich, you do not know the importance of Italian olive salad. But if you have eaten New Orleans cuisine, you want this stuff in your refrigerator at all times. It is so versatile, you can use it for everything. Heck. You can eat it with a spoon. It’s that decadent. We have a killer recipe for this stuff. We have been thinking about marketing it for years. And we have never, ever seen it in the marketplace. Last Tuesday, Fluffy saw muffaletta olive salad in Costco. Mind you, it could not have been as good as ours because it was bottled and not fresh. But one by one, we have seen our Book of Mormon action figures done (not as well as ours), our baked beans done (not as well as Botchie beans), and our Italian olive salad done (not as well as ours). You sit on these things, and somebody else does them. That’s just the way things happen. If we had ever been the ones to follow up on our ideas, Fluffy and I would be kings, financially speaking. I believe I have written about my idea for bottled water, back in around 1970, before anyone ever had thought of anything so preposterous. The Mormon bishop entrepreneur to whom I took this idea told me I was crazy. “Nobody will ever pay for something they can get out of the tap for free,” he said. Shame on me. I let his words convince me that I was an idiot. If I had had the stick-to-itiveness of Thomas Alva Edison, the little town of Mandeville, Louisiana would be rich and famous, and I would be raking in the cash for my “Artesia” water. I would have an elevator in my house to protect my feet and my knees, and I would be riding in a car that would have been built in this century. But then, maybe I would not be as humble as I am today, and maybe Mandeville would be overrun with obnoxious and money-grubbing people. I’d hate to see that. I always had fond memories of Mandeville, and the place probably got a lot better after I left, even if only because I was gone. In the long run, God always knows what he’s doing. Darn it. We may plead and plead for Him to give us stuff, but it just about never happens. God isn’t a gumball machine where you pop in a prayer and He dispenses a shiny new car or a million bucks. He just doesn’t work that way. But just maybe … maybe if we pop in a prayer and do the work of a Thomas Alva Edison, He’ll give us the rewards that go along with the work and we can create the next generation of light bulb or television or some other gizmo that hasn’t even been thought of yet. It’s worth thinking about. And maybe thinking some more. And as long as you’re thinking, maybe doing the requisite work, too.